There many things to do in Panama City, Panama. The capital and largest city of the Republic of Panama has an interesting mix of the old and the new. In this article we will look at two of the most popular tourist atractions; The Panama Canal Locks and the Casco Viejo (Old Town). Panama is famous for it epic feat of industrial engineering, the Panama Canal, and the city of Panama sits at the mouth of the Canals Pacific entrance. But with several world heritage sites, various coastal activities, and plenty of restaurant and entertainment options you are sure to find Panama City an enjoyable experience. 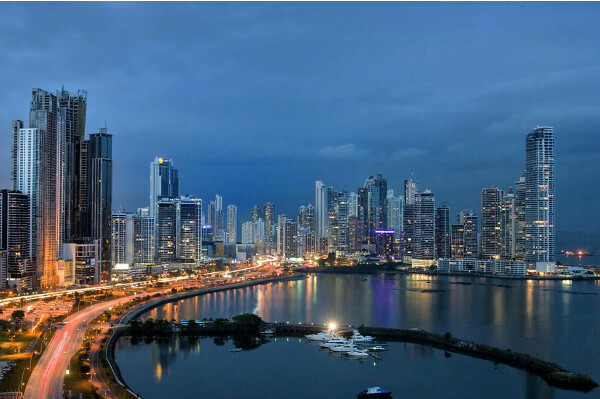 Panama has had its ups and downs over the years, but Panama City has benefited greatly from the construction of the canal, with huge economic growth and improved infrastructure. As well as the canal trade and tourism, the city has a healthy financial services sector. These industries have seen property and construction booms create rapid change. Rising from a small city of just over 40,000 to a bustling urban center of nearly 1 million people in the last 100 years. The skyscraper skyline tells the story of a booming city. 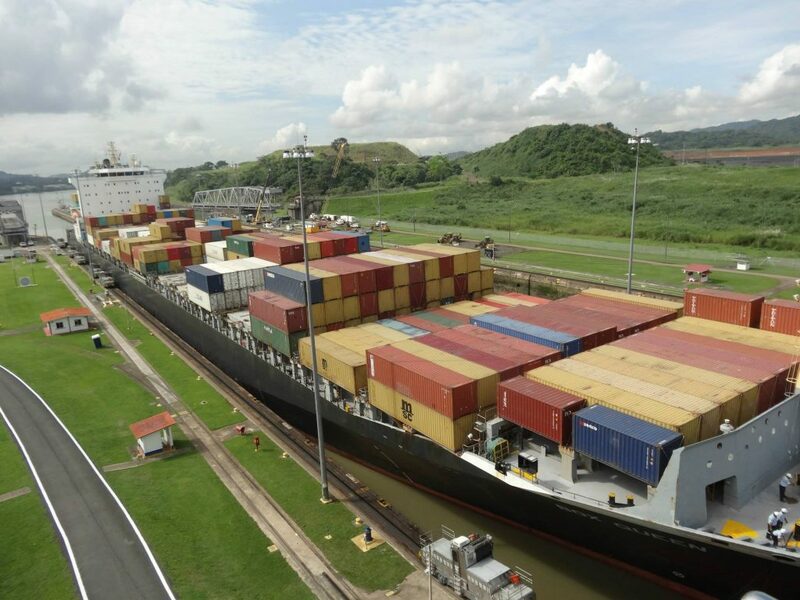 Since the Panama Canals construction and completion in 1914, Panama has become a global transport hub. Joining the Pacific and Atlantic oceans with 77 km (48 miles) of artificial waterway, the canal is one of the seven wonders of the industrial world. Staying in Panama City you are always aware of the canals entrance, and especially the ships which queue in the Gulf of Panama waiting to pass. But the best place to witness the canal in all its glory, is to the visit the Miraflores canal lock center. A part of the engineering complexity of the canal was the fact the ships would need to traverse the uneven altitude of the Panama isthmus. This is achieved by the series of three Panama canal locks which permit 50,000 ton ships to pass along the canal. The ships reach a maximum height of 26 meters (85 feet) at the highest point, and then back to sea level again to exit the canal. 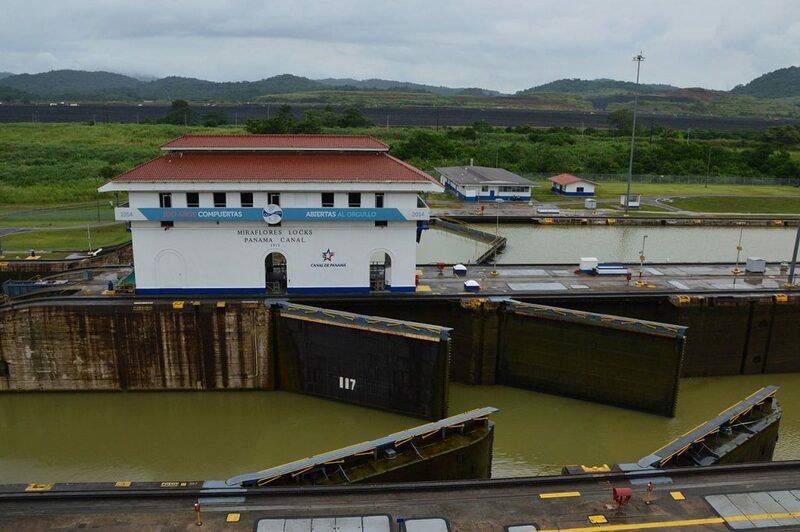 The Panama Canal Locks really are a sight to behold. Each of the locks require 27 million US gallons of water to fill from the lowered to the raised position. At the Miraflores Canal Lock Visitor Center, you can watch ships as they enter the locks, and are either lowered or raised depending on direction of travel. After a ship enters from the Gulf of Panama bound for the Pacific, it is raised and then released. Almost immediately a ship traveling in the opposite direction will replace it to be lowered. 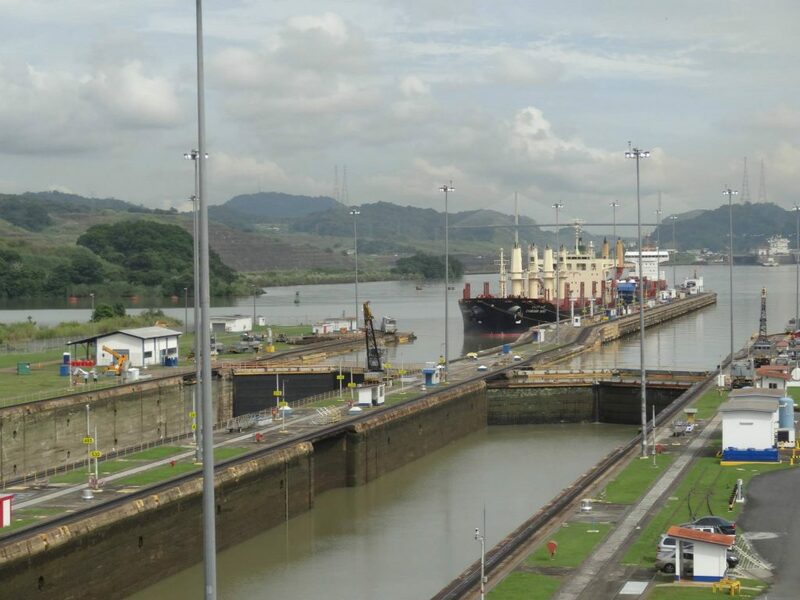 The canal is in constant use, so even a short trip to the viewing gallery will allow you to see the Panama canal lock in action. If you want to see the Pedro Miguel Locks which are a short distance from the Miraflores Locks. You can view them from Miraflores with the use of binoculars. The Miraflores center also has a museum, restaurant and a gift shop. The entry for the Miraflores Visitor Center is $15 (USD) for adults and $10 for children (6-12 years). Panamanian Citizens can enter at a reduced rate of $3 on production of their national ID. This is to allow some of the lower-income families of Panama to witness their famous canal. The Miraflores visitor center is located just outside of North West Panama City. A standard taxi will cost you around $15 each way, an Uber car between $10-12. Buses and Metro options are available, with a short walk from the bus terminal to the visitors center. Special sightseeing canal tours are available and can cost anywhere from $80-$150. As it is the historic district, you will find many things to do in Casco Viejo area of Panama City. Casco Viejo was built after the previous Panama City (Panamá Viejo) was completely destroyed by the Welsh privateer, Henry Morgan. It was founded in 1673 at 7.5 km southeast from the original site. You will find a great selection of colonial architecture from this period throughout the area. To prevent further attacks the new town was heavily fortified and made good use of the local morphology to compliment the man made fortifications. The area within the walls has an orthogonal layout, with a central plaza sprouting variously sized streets. The majority of the seaward colonial fortifications and parts of the landward bastions and moat are still intact. There are several important buildings which represent the country’s 17th-20th century heritage. 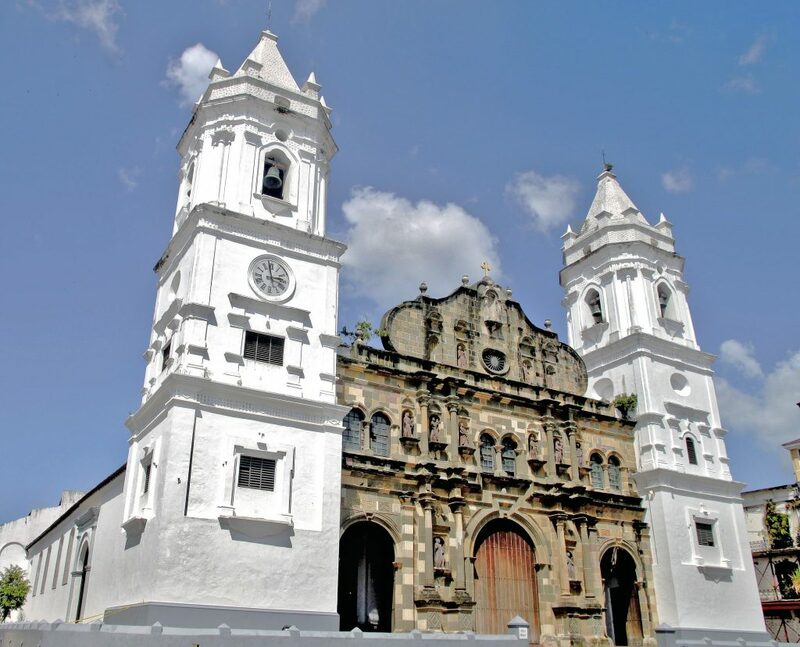 The Casco Viejo has numerous magnificent churches, and the wonderful Sacred Heart Cathedral, the Basilica of St. Mary (La lang=”es” xml:lang=”es”>Catedral Basílica Santa Maria la Antigua de Panama). The cathedral took 108 years to build from 1688-1796 and has five aisles and a timber roof. The churches San Felipe Neri, San José, San Francisco and especially La Merced with its well-preserved colonial timber roof are also excellent examples. The Presidential Palace originally built in the late 17th century and partly reconstructed in the 18th, 19th and early 20th centuries. It is the current governmental office and residence of the President of Panama. The Salón Bolivar is a building of special historical importance. It was originally the Chapter Hall of the convent of San Francisco, and is the only surviving part of the 17th-18th century complex. In 1826 Simon Bolivar the Venezuelan military and political leader, who at that time was the first president of Gran Colombia, attempted to set up what would have been the world’s first multinational and continental congress in the building. However, the vision was aborted due to internal political problems across Gran Colombia. There are also several exceptional examples of domestic colonial architecture, in particular the mid-18th century Casa Góngora. You will also find several hundred houses from the mid-19th to the early 20th centuries. There are various organized walking tours around Casco Viejo which can take a couple of hours. The cost in the region of $60 to $130 (USD) depending on what is included in the tour. You can find tours that included food tasting and cover more than just Casco Viejo. So you need to shop around and find a company that suits your needs. Alternatively you can use my usual method. Grab a map and walk the route yourself in your own time. Panama City has a namesake in the United States. Some of you may have heard of Panama City, Florida. A smaller, but no less wonderful, city of 37,635 on U.S. Route 98, between Tallahassee and Pensacola. Panama City, Florida, is a very pleasant coastal city with crystal white sands and the emerald clear waters of the gulf of Mexico. The city was formerly a town named ‘Harrison’ until a Chicago Rail Road man called George Mortimer West renamed it Panama City in 1909. His vision was to build a rail line from Chicago to his newly named Panama City. A straight line between Chicago to Panama City, Panama intersected the town, and with national interest in the construction of the Panama canal high, he used this as a marketing tool to increase interest in the Bay Area, and increase property prices. When I visited Panama City in 2013, I stayed at the impressive Trump Hotel Panama. The building is a sail shaped building, almost like the Burj Al Arab in Dubai. The hotel sent me a GMC Yukon to collect me from the airport which costs $88.50 (USD) one way. The journey takes about one hour and in that time the driver who was very friendly, gave me a one hour lesson on Panama City. He was especially vocal on Henry Morgan, and his attack on Old Panama. He found it particularly amusing when he noticed I shared a surname with the dastardly pirate. I told him we were not related. The rooms were to a high standard. My king double had a sea view with balcony, and the bed was very comfortable. I would go as far to say it was the best nights sleep I have ever had. A bold statement I agree, but I still think about the comfort of that bed four years later. Maybe I am just used to cheap beds. The concierge and staff are impeccable. They can help you book any trips or excursions you might need. There always seemed to be an exceedingly friendly staff member within easy reach when I needed one. Usually, I don’t eat in the hotels where I stay. I like to go out and about to find a restaurant. However, the Trump Panama has a very good selection of wining and dining options. Barcelona is a contemporary bar and restaurant serving Panamanian dishes. This is where the breakfast is served, and there is a good choice at the breakfast buffet with different Panamanian and regional delicacies. The ingredients are swapped around each day for added variety. There is also a good room service menu. Various other suites are available. If you would like somewhere slightly easier on the wallet, but still to a high standard then check out Casa Andrea. I have not stayed there personally, but I was recommended this hotel by several friends and colleagues. Apparently the rooms are simple, but clean, spacious and well maintained. The staff really make an effort. All the main facilities are available. Free wifi, airport shuttle, breakfast and family rooms. The location is good for the price. It is not in immediate walking distance to any of the main attractions, but it is quite central to most of them. Which means you are never more than a few kilometers away. If you have any comments or questions, please feel free to let us know in the comments section below.